This picturesque provincial town’s venture into the realms of international tourism has been fairly recent. The one-time holiday destination of Thailand’s high society has managed to retain its sleepy and untouched charm while still playing host to some superb properties. The area is pretty much defined by Khao Takiab (Chopstick Mountain) at the end of the road adjacent to the beach leading up to the areas premier attraction. All the resorts, hotels and restaurants are on this road making everything easy to find. 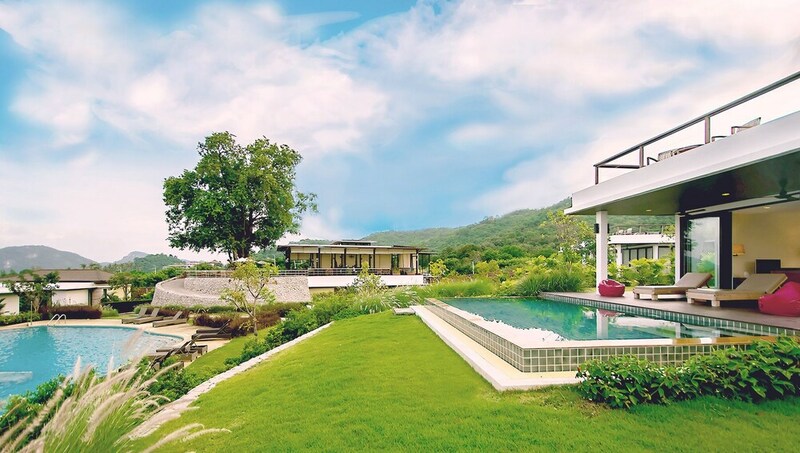 Just 10 kilometres outside of Hua Hin, choosing Khoa Takiab will ensure a more peaceful retreat with the possibility of eventful evenings in Hua Hin itself. The stretch of tree-lined bay is dominated by the imposing Khao Takiab and the surrounding rock formations. It’s for this reason, and the fact that it is more secluded, it is the preferred choice of some visitors to the province. And why not? It has everything Hua Hin has in terms of beauty and charm and whatever it lacks that its livelier neighbour might have is just a ten-minute drive down the road, offering the best of both worlds. The three main activities of any visit to Khao Takiab are primarily relaxing, walking and nautical adventures. As with this entire coastline, the shallow water makes for ideal kite and windsurfing territory. Snorkeling and kayaking also rank highly as popular activities around the area. If you are less inclined to take to the water than you are the land, then renting a bike or setting off on a day of exploration by foot is just as easily done. Architectural attractions are pretty much dominated by the temples. Of course, if the intense heat puts you off doing anything too strenuous then just soaking up the sun on the beach with a cooling breeze is always a good idea. The staple attractions of any visit to Thailand can be found in Khao Takiab – temples, monks, idyllic beaches, untamed tropical vegetation and monkeys. Khao Takiab Mountain is home to an abundance of cheeky monkeys so expect to see locals keeping them as pets too. The most famous structural attraction is Wat Huay Mongkol where a statue of revered monk, Luang Phor Thuad stands. Beyond this, many people come to Khao Takiab to catch the boat to Koh Singto, a blissfully peaceful and uninhabited island just a 20-minute boat ride away. This area is all about seafood – freshly prepared, beautifully presented and reasonably priced .In terms of this, it is a world-class destination, combining delicious food with sublime settings. Time spent in Khao Takiab feasting on the delights from the Gulf of Thailand is one of the primary reasons so many people visit this part of country. Ultimately, the food is spectacular. Beyond seafood there is still a diverse choice of cuisine ranging from haute cuisine to classic Italian and Pan Asian dishes. Whether you prefer meat, fish or pasta-based food you’ll be able to find it here. They great thing about this suburb is that most of the restaurants occupy prime positions on the beach, so ocean view dining is easy to find and is incredibly pleasant. The high concentration of resorts around here means that upscale dining in air-conditioned, cooler surroundings is easily done. Along Khao Takiab Road there are a number of casual eateries, in particular Papa John where the stone-baked pizzas are always a good choice. Further down the road on the cusp of Hua Hin Town is the Pasta Factory, an intimate place with an extensive choice of its namesake food. Anyone visiting Khoa Takiab should almost certainly make the mountain top restaurant, La Mer a priority. Much like the pace of life around here the nightlife is laid back, consisting of a few beer bars, hotel establishments and a late-night art gallery. Khoa Takiab Road has a handful of bars owned by expats that have darts boards and pool tables and televised live sports. Beyond this some of hotels in the area provide live entertainment for guests in pleasant surroundings. For anything more upbeat jump in tuk tuk or taxi to Hua Hin which should cost no more than 150 baht and take around 10 minutes.